LANGKAWI, Malaysia — A boat crammed with more than 500 refugees was found on Wednesday off the coast of Penang island in Malaysia, the latest evidence that thousands of Bangladeshis and Rohingya minority are desperately trying to reach land after being abandoned by their human traffickers. The overcrowded boat is full of people, and there is no information if they will be allowed to come on shore, said Zafar Ahmad, who heads the Myanmar Ethnic Rohingya Human Rights Organization of Malaysia. “We are hearing that their plight is desperate but we are unsure what the fate of the boat is. We urge the Malaysian government to give these Rohingya refugees protection and shelter,” he told The Associated Press. The information was corroborated by another person with knowledge of the situation. The person spoke on condition of anonymity and is not authorized to speak to the media. Government officials did not immediately answer phones when reached for comment. 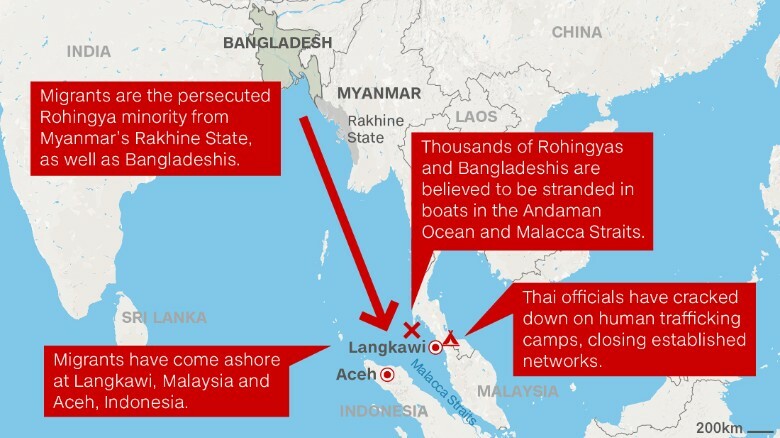 Abandoned at sea, boatloads of hungry men, women and children Bangladeshis and Rohingya, members of Myanmar’s long-persecuted Muslim-minority, appear to have no place to go after Malaysia and neighboring Indonesia [both Muslim-majority countries] refused to give them refuge. Hours earlier, Indonesia pushed back a boat packed with hundreds of Rohingya and Bangladeshis, saying they were given food, water and directions to Malaysia – their original destination. The refugees are victims of human traffickers who promise them safe passage from their countries to Malaysia. But in recent weeks the smugglers have fled wooden trawlers carrying the refugees for fear of being caught in a massive regional crackdown on human trafficking syndicates. In the process, they have abandoned their human cargo and set them adrift in the sea off Malaysia and Indonesia without food or fuel, and themselves escaped in speedboats. Some estimates put the number of refugees stuck in the Malacca Strait and nearby waters at 6,000, some stranded for more than two months. Activists believe many more boats will try to reach land in the coming days and weeks. Already, about 1,600 migrants have landed on shore in Langkawi and neighboring Indonesia, the two Muslim-majority countries that over the years have shown the most sympathy for Rohingya’s plight. The United Nations pleaded for countries in the region to keep their borders open and help rescue those stranded, while some parliamentarians slammed the “not-in my-back-yard” attitude. In one of the most striking examples of the refugees’ plight, Chris Lewa, a human rights activist, contacted a person on board one boat several miles off Langkawi Island by mobile phone that carried a Thai number and was kept charged by the vessel’s power supply. The person said they had been four days without food or water, and saw a patrol boat with flashing lights approach late Tuesday. But instead of stopping, it slowly passed them by. Lewa, director of the nonprofit Arakan Project, was still talking to that man when the boat passed by. She told the AP that she heard on the phone the refugees’ first hopeful cheers turn into sobs and screams. Labeled by the U.N. one of the world’s most persecuted minorities, the Rohingya have for decades suffered from state-sanctioned discrimination in Buddhist-majority Myanmar. Denied citizenship by national law, the Muslim Rohingya’s are effectively stateless. Access to education and adequate health care is limited and freedom of movement severely restricted. In the last three years, attacks on Rohingya have left 280 people dead and forced 140,000 others into crowded camps just outside Sittwe, the capital of Myanmar’s Rakhine state, where they live under abysmal, apartheid-like conditions, with little or no opportunities for work. That has sparked one of the biggest exoduses of boat people the region has seen since the Vietnam War, with an estimated 100,000 men, women and children boarding ships in search of better lives in other countries since June 2012, according to the U.N. refugee agency. The first stop, up until recently, was Thailand, where migrants were held in jungle camps until their families could raise hefty ransoms so they could continue onward, usually to Malaysia. Recent crackdowns, however, have forced the smugglers to change tactics – instead holding people on small and large ships parked offshore until they collected about $2,000 per person. Struggling to put a positive face on its dismal human trafficking record, Thai authorities have discovered more than 70 former camps near the border with Malaysia, the biggest of which was found Tuesday. It appeared to be newly abandoned, well-constructed and able to house as many as 800 people, said Lt. Gen. Prakarn Chonlayuth, the southern regional army commander. Several navies were called upon to carry out search and rescue operations. Capt. Chayut Navespootikorn of the Royal Thai Navy of Operation Fleet Area 3, said several boats and aircraft had been deployed to scour his country’s territorial waters, but nothing has turned up. He said his fleet was back out there looking Wednesday. Migrants stranded at sea for four months off Indonesia resorted to stabbing, hanging each other and throwing passengers overboard in a desperate struggle for the last remaining food, according to those who finally made it to land. Varying accounts said between seven and 100 people died during the fights, which apparently involved ethnic-based violence among migrants who were all from Burma and Bangladesh. Mahmud Rafiq, 21, a Rohingya man from Burma, blamed the attacks on the Bengalis, saying they refused to give the remaining food to women and children. “They then started hitting us. They took the food,” he said. 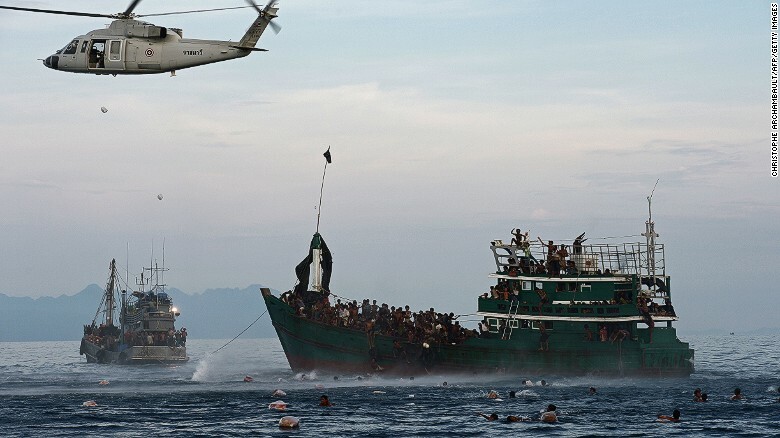 The violence erupted on a boat carrying about 700 people which was reportedly rejected by the Indonesian navy and escorted to Malaysian waters, where it was rejected by the Malaysian navy. It ended in Indonesian waters, where the passengers were rescued by local fishermen. The horrific accounts came as countries in the region turned away migrants in what has been described as a “human ping pong”. The UN urged south-east Asian nations to accept the thousands of migrants from Burma and Bangladesh believed to be stranded on boats following the recent clampdown. Many of the migrants are oppressed Rohingya Muslims from Burma who have been described by the UN as one of the world’s most persecuted peoples. Malaysia, the favoured destination for many of the migrants, has urged Burma and Bangladesh to try to halt the flow of migrants. “What is the responsibility of the Myanmar government … is there any humanitarian aspect for them to solve this matter internally?” said Muhyiddin Yassin, Malaysia’s deputy prime minister. Malaysia’s foreign minister was due to meet his Bangladeshi counterpart on Sunday and those from Indonesia and Thailand on Monday and Wednesday. Charles Santiago, a Malaysian MP and human rights promoter, said leaders in the region have “stood by and watched, celebrating their achievements at fancy dinner tables, while ignoring the human misery that their failures have produced. “The need for effective regional action to combat the crisis is clear, yet our leaders have consistently failed to act,” he wrote in The Jakarta Post. Daily posting and “Answers” emails will end for the school year on Friday, May 29th. This week’s “Tuesday’s World Events” post is a little different. The news story on the plight of the Rohingya and Bangladeshi refugees involves several countries. Therefore, it will be the only world news story for this week. Answer Question #1 Background information for the major countries involved in this story (Burma, Malaysia, Indonesia and Thailand). 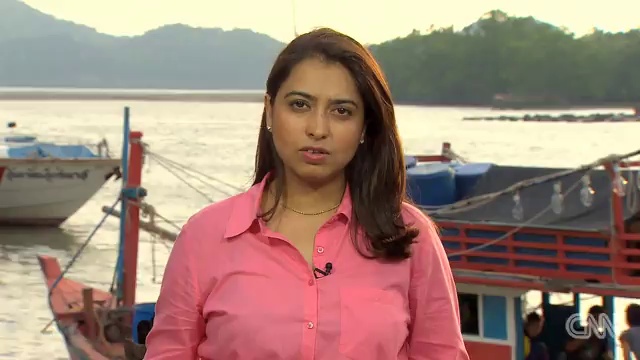 b) Who are the Rohingya and Bangladeshi refugees stranded on boats in Southeast Asia? c) What is their religion? d) From what countries are they escaping? e) Why are they leaving their countries in such large numbers? f) What countries are they trying to reach? g) Why are they being turned away? Burma had been ruled by a military junta for almost 50 years. A junta is a government, especially a military one, that has taken power in a country by force and not by election. In 1989, Burma’s military junta changed the name of the country to “Union of Myanmar.” This controversial name change was not recognized by the opposition groups and many English-speaking nations. Britain conquered Burma over a period of 62 years (1824-1886) and incorporated it into its Indian Empire. Burma was administered as a province of India until 1937 when it became a separate, self-governing colony; independence from the Commonwealth was attained in 1948. The military has ruled since 1962, when the army overthrew an elected government that had been buffeted by an economic crisis and a raft of ethnic insurgencies. 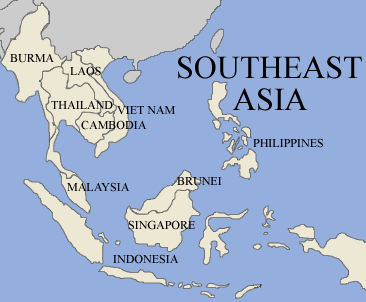 During the next 26 years, General Ne Win’s military rule helped impoverish what had been one of Southeast Asia’s wealthiest countries. The generals who ran the country stood accused of gross human rights abuses. A nominally civilian government led by President Thein Sein – who served as a general and then prime minister under the junta – was installed in March 2011. However, a new constitution brought in by the junta in 2008 entrenched the primacy of the military. A quarter of seats in both parliamentary chambers are reserved for the military, and three key ministerial posts – interior, defense and border affairs – must be held by serving generals. Despite this inauspicious start to Myanmar’s new post-junta phase, a series of reforms in the months since the new government took up office has led to hopes that decades of international isolation could be coming to an end. Islam is the most widely practised religion in Southeast Asia, numbering approximately 240 million adherents which translate to about 40% of the entire population, with majorities in Brunei, Indonesia, Malaysia and in Southern Philippines. Buddhism is predominant in Thailand, Cambodia, Laos, Burma, Vietnam and Singapore. Ancestor worship and Confucianism are also widely practised in Vietnam and Singapore. 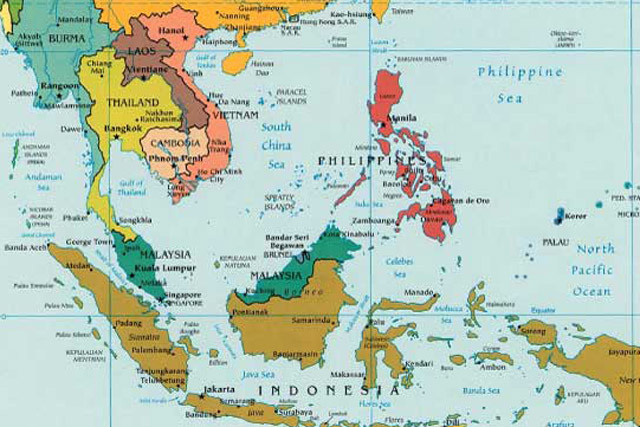 Indonesia is the world’s most populous Muslim nation, although Hinduism is dominant on islands such as Bali, Indonesia. The Rohingya people are Muslim people who live in northern Rakhine (Arakan), Burma and speak the Rohingya language. Muslims have settled in Arakan since the 15th century AD. During World War II…the region became increasingly polarized. In 1982, General Ne Win’s government (a military junta) enacted the citizenship law which denied Rohingya citizenship. Since the 1990s, the term Rohingya increased in usage among Rohingya communities. As of 2013, about 735,000 Rohingyas live in Burma. They reside mainly in the northern Rakhine townships where they form 80-98% of the population. International media and human rights organizations have described Rohingyas as one of the most persecuted minorities in the world. Many Rohingyas have fled to ghettos and refugee camps in neighboring Bangladesh, and to areas along the Thai-Burmese border.